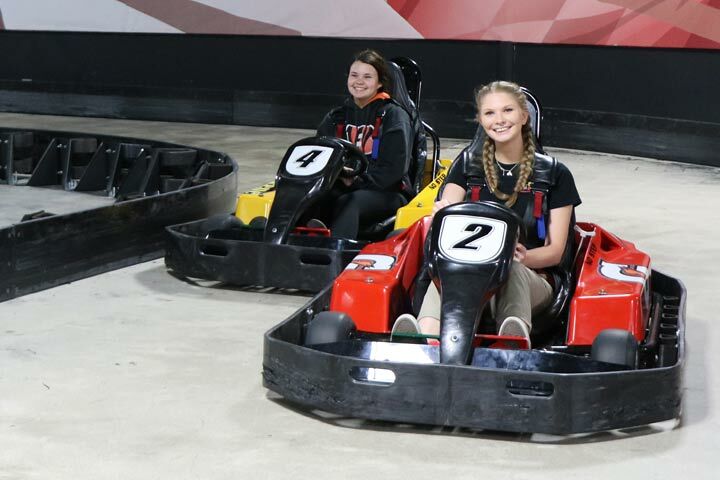 Race around the track and speed past your friends on our awesome indoor electric go-karts! Are you ready go-kart racers? Its time to start your engines… they’re off! At Scene75 Pittsburgh’s “Thunder Volt Speedway” you will experience a rush of adrenaline as you zoom past competition! You’ll be racing around tight bends and accelerating on the straight aways up to speeds of 20mph. Each race will host up to 10 racers, including single and/or double seater go-karts. Scene75 Pittsburgh will use a sophisticated lap timing system to record your lap speeds and times. With system accuracy all the way to the 1000th of a second, we will be able to really see the best driver. When your race finishes, you will be able to see the places of each individual racer along with their average lap time on the track TVs. The overall winner is the person with the quickest average lap speed. But, even if you aren’t the overall winner, you can still get your bragging rights as you pass your friends on the track. At Scene75 we use the latest “no emission” go-karts. This technology makes them both remarkably quiet and environmentally friendly without sacrificing speed or performance. Scene75 Pittsburg’s go-karts will be skill appropriate and fun for all ages from kid to adult! In order to operate the go-kart all drivers must be 10 years or older and at least 54″ tall to drive. Furthermore, the driver must be able to reach pedals and operate the kart in a safe manner. Families with younger kids will enjoy our two seat go karts, allowing everyone to enjoy the thrill of a race! Double-seater go-karts are available for those too young to drive and are above 36” tall. If a driver is unable to control the kart in a safe manner without bumping other riders, he or she may be removed from the track.